A lit­tle late, but I just got home. Jan­u­ary 4, 2012, North­field, Minn. — St. Olaf men’s bas­ket­ball head coach Dan Kos­mos­ki (stand­ing) watch­es as Char­lie Asle­sen (42) dunks the ball past Condordia’s Jesse Wixo dur­ing a game be­tween St. Olaf and Con­cor­dia-Moor­head Jan. 4, 2012 in North­field, Minn. St. Olaf won the game to im­prove to 5–6 (4–2 MIAC). And a bonus im­age to show the re­ac­tion to the dunk. 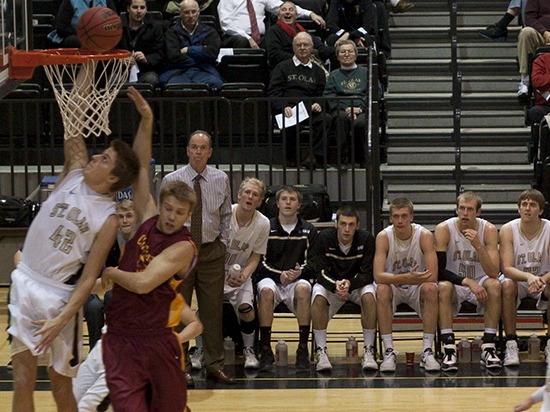 Jan­u­ary 4, 2012, North­field, Minn. — The St. Olaf bench re­acts to a Char­lie Asle­sen (not shown) dunk dur­ing the sec­ond half of a men’s bas­ket­ball game be­tween St. Olaf and Con­cor­dia-Moor­head on Jan. 4, 2012 in North­field, Minn. St. Olaf won the game to im­prove to 5–6 (4–2 MIAC).